We have received many emails, tweets, and message of support for our classroom as a result of the video tour posted last week. Many, many thanks for the interest you have shown in our work and children! One question that has arisen many times is 'what does our schedule look like?'. This has inspired the following blog post. We always welcome feedback and constructive comments for improvement from our families, blog visitors and professional learning network! “…curious, asking questions as active seekers of information; use their senses to gather information about their environment; sort, match, and classify objects quite naturally in their play; can make simple causal explanations of events using their personal knowledge, which also enables them to make predictions; are making connections, talking about similarities, and drawing conclusions; represent their ideas in many different ways through e.g., building with two and three dimensional objects, drawing, dramatizing; are imaginative e.g., in their solutions of problems.” (ETFO, 2010, p.22). An inquiry-based activity should draw on these characteristics, acknowledge a student’s interests and should involve materials that “ provoke a sense of mystery and wonder so that children become curious about how they work, where they come from, and what can be learned by manipulating them” (Curtis & Carter, 2003, p.17). In our classroom we intentionally observe and engage children in order to gain a deeper understanding of their interests. The information that we gather provides the “spark” for classroom inquiry-based explorations. (For example, after noticing children’s interested in puddles outside at recess time, an inquiry-based series of activities were developed together with the children to explore the concept of rain, water evaporation, and natural events outdoors.) Keeping children’s interest in mind, we purposefully co-planned authentic experiences from which they can create meaningful observations and engage in exploration. Exploration naturally leads to investigation. After the children’s interests have been identified through exploration, a planned investigation might be conducted to further their knowledge on this particular subject. The findings gathered from this investigation will be communicated through documentation, verbal discussions, and physical demonstrations. We ensure curriculum is followed by highlighting and incorporating expectations that naturally compliment the focus of inquiry. Sometimes this means bringing ideas back to the larger group for discussion or explicit instruction to help deepen our collective understanding and drive the project forward. Inquiry-based learning is a shared responsibility between the teacher and children. As an intentional teacher I listen, observe, assess, model and support my students’ learning; while they use their five senses for exploration and investigation to "build new understandings from existing ideas and concepts" (ELECT, 2007, p. 15). As outlined in The Kindergarten Program (2006), “The guidance of a thoughtful teacher is essential to enable children to learn through inquiry. Teachers should use inquiry-based learning to build on children’s spontaneous desire for exploration and to gradually guide them to become more focused and systematic in their observations and investigations” (The Kindergarten Program, 2006, p.11). The integration of other subject areas can work to heighten inquiry-based learning by making it easier for students to “build on their existing knowledge, create and clarify their own new understandings, and experience a variety of approaches to a problem or question” (The Kindergarten Program, 2006. P. 11) while fulfilling various curriculum obligations. Various subject matters and skills can be explored and acquired through the intentional, yet seamless interchange of these learning approaches; however, all learning must still begin with a “spark” that is rooted in student interest in order for the experience to be meaningful. Families drop their children off in the classroom and children put their belongings in their cubbies, participate in their corresponding sign in activities, and proceed to a play activity of their choice. Many children enjoy touring the room to see what new invitations have been set up on tables or included in the centres. They are able to immediately participate in these activities, return to an activity from the previous day, or sit together with a friend and talk. This gives children a chance to socialize, and get themselves comfortable and ready for our day. We find that many children enter our room with interesting objects from home or the playground (e.g., feathers, books) and these often spark interest from other children that is then explored during the playtime. This open entry time counts as my supervision minutes for the week. I love being able to personally greet each child upon entry, make conversation with families and catch up on how a child's night and morning have been or share important information, and watch the children ease into our day. Because this is a staggered entry and not all children arrive at the same time, it is a leisurely welcome and one that feels meaningful. After children have engaged in an approximately 30 - 40 minute playtime they are invited to join me on the carpet for opening circle. Children are able to finish up their playtime activity before joining me or also have the option to return to the activity after circle. This main gathering time is a great chance for the children to come together as a community and set a positive tone for our day together. After procedural items like attendance are complete the main focus on this circle is usually literacy (reading, writing, and oral language) with other curricular areas interwoven in order to make learning layered and meaningful. We begin by reading a morning message written to the children. It usually has information about anything special happening in our day and a quick shared literacy or math activity to do together (e.g., similar to a 'minds on' in math). Many times these activities are related to an ongoing inquiry (e.g., this week we have been discussing why our school yard is so special so the morning message activity asked children to brainstorm reasons for why we should take care of our yard). New invitations for play and materials added to centres are also discussed at this time. Children plan for what they might like to explore or investigate for playtime and engage in a planning experience to help with this (e.g., quiet reflection, elbow partner discussion). Once circle is complete children can proceed to learning centers. Children have choice and control over where they explore within the classroom. We do not assign children to centres or limit the number of children who can play in an area. During play children spend time engaged in learning-based play activities within the classroom including (but not limited to): dramatic arts, sand, water, reading, writing, play dough, math, science, listening, art, painting, drama, loose parts, construction, and fine motor toys. Additional seasonal or inquiry based activities are also available. Children are encouraged to use the materials in innovative and creative ways that compliment their interests of inquiry and collaborative exploration. On table tops there are often teacher-guided activities (e.g., natural materials exploration, science experiment, art activity) and children are invited to work with an adult at the center. Children can freely move materials around the room to use in ways that compliment and extend their experiences (e.g., loose parts in the dramatic play centre). Our classroom is a learning-based, play-based authentic environment focusing on student exploration, socialization, and community learning. We aim to promote and strengthen student self-regulation. Centers can be classified into three categories: manipulative, make and take, or extensions. Manipulative centers are experiences that provide students the opportunity to explore, practice, refine, or extend a skill or area of interest by manipulating concrete objects (e.g., make a picture out of pattern blocks, writing words with magnetic letters, creating designs with geoboard and elastics). Make and take centers provide students the opportunity to explore, practice, refine or extend a skill or area of interest by manipulating and creating something that can be put into a portfolio, posted on our walls, or brought home (e.g., mixing the primary colours while sponge painting, stamping words with stampers, decorating names with pasta). Extension centers are materials that are put out by the teacher at center time to compliment or extend a lesson taught at circle (e.g., felt pieces that retell the read aloud text). Our classroom is an integrated classroom, with both JK and SK children. All students can use the materials put out at centers in varied ways. Because activities are not “cookie cutter” in nature, each child can explore and experiment with the materials at the center at their own developmental level. The process of learning is valued more than the product. When a teacher is available at the center and able to scaffold the instruction, based on the explicit needs and interests of the student, heightened learning opportunities can occur. Assessment opportunities include taking photos and videos of children engaged in play opportunities, anecdotal notes, checklists, artwork, recorded vignettes, transcribed interviews with children, writing and drawing samples, and diagnostic tools. Assessment happens primarily during the play block and can also occur during small group time. At the conclusion of the first playtime children are first given a ten minute warning that clean up will happen shortly, and then asked to clean up. We find that because children have had so long to play, they are quite willing to tidy up and regroup on the carpet for another circle. Once all children are on the carpet, the special 'star student of the day' has the opportunity to visit each area of the room to assess whether or not is has been cleaned to satisfaction. If the centre is a 'thumbs up' clean, the child moves on. If the centre is not cleaned to the child's approval volunteer children are called to tidy the area some more. This is our way of ensuring children are responsible for the environment and that the room is completely tidy before moving on. We usually begin this circle with a fiction or nonfiction text that relates to our current project or inquiry. Sometimes an activity focusing on a main math/science/personal or social concept is also presented if it relates. This is our way of ensuring that ideas from the inquiries are brought back to the whole group so that all children can participate and acquire knowledge from the explorations, even if they choose not to participate during playtime. It's also a chance to ensure that we are meeting curriculum obligations and covering expectations while using the inquiry to guide our planning. The children then dress for outdoor play and head outside. There are three kinds of outdoor activities that we regularly use (not all on one day). Free outdoor play with materials: We have an abundance of outdoor toys like balls, hula hoops, bikes, etc. and the children enjoy using these in the yard. We set these up in a centre formation (e.g., all the hula hoops together, all the balls together) and the children are invited to play with any equipment they'd like to during our time outdoors. We also bring many consumable materials outside with us including bubbles, sidewalk chalk, paint, clipboards and writing materials, etc. Guided outdoor play activity: In this type of activity we lead children in a purposeful activity related to a current interest or inquiry. For example we might visit a favourite area of the yard with our sketching pads or go on a nature walk with the ipads and look for math in the yard. Open-ended outdoor play with no materials: We have a large play yard and many times we will visit different areas of it with no equipment at all. Children are encouraged to use found and natural loose parts (e.g., rocks, sticks, flowers) in their play. This is imaginative play in its purest form and a joy to watch. When finished the children tidy up the materials, enter the classroom and put away belongings in their cubbies. Children regroup on the carpet for a quick whole group meeting. Usually there is consolidation and sharing from either of the first two play blocks (indoor and outdoor) or children share treasures from nature found outdoors. Sometimes the educator reads another book or a 'poem of the week' to children and more planning for the afternoon is done. In our room the children are able to free flow to a snack centre during the first play block and eat when they are hungry. During the whole group lunch time children eat their lunch in the classroom and are supervised by lunch monitors. Tables that are placed around the room are cleared of materials and the children replace these when they are finished eating their lunch. One of my professional goals is to have a free flow eating schedule throughout the entire day and eliminate the whole group lunch, but the logistics of our schedule have made this difficult to plan and we are continuing to reflect on how to best accomplish this. When children are done eating their lunch they participate in a quiet activity like reading, drawing, writing, or chatting with friends. Children gather for one last circle time. Afternoon attendance is taken. Usually a read aloud occurs along with another focused activity that relates to the current interest of the children. Children are invited to share something from their day with the whole group during a sharing time. Sometimes the educators revisit rich moments from the play by pulling up digital photos and videos in a draft blog post (using the smart board) and the children reflect upon the experience and co-write the blog post for the day. Mail is handed out and children pack their note totes and get ready for the end of the day. Everything is packed in backpacks and children head outdoors for one final play block. Children are able to participate in a second outdoor playtime that includes a free, guided, or open-ended activity. At the conclusion of the outdoor play time toys are tidied and returned to the shed and the children enter the classroom. Because they are already dressed for home (and this is especially beneficial during cold snowsuit weather) we have fewer transitions requiring children to dress and undress in outdoor clothing. Children enter the classroom and sit in their cubbies. Children who take the bus are escorted to the bus line at the back of the school by an educator while another remains in the room to dismiss children picked up by families. Seeing each family at the end of the day gives us another chance to chat and share something from the child's day. The families are also eager to look around the room and see the new art and documentation on display. It is a calm, peaceful way to end our time together. I appreciate this glance into your day. Thank you! Thank you so much for visiting us Melissa! Thank you so much for this wonderful post. I am still so new to the ideas of emergent curriculum and inquiry. Designing the environment was the first change I made. I've been working on documentation but am really struggling with planning and basing my teaching on the needs of the students (it sounds so bad when I say it like that)!. I still wonder how you teach concepts like letter knowledge, rhyme, writing, etc. in such an open ended day? I am just having a difficult time giving up so much 'teacher control'-even though all the research I read explains why and I truly believe it s the right way to teach. I just don't know how to do it!! I see how your open time allows the children to build on these concepts, but do you ever do direct instruction? If so, is this done during your circle times? Do you ever work with small groups on individual students during their free play? As always, thank you so much for any support or guidance you can offer this newby! Thank you so much for your comment! I agree, it's like a delicate dance, isn't it? We are conductors who are seamlessly planning and implementing all of these things into our day. We definitely engage in explicit instruction (especially in whole groups) and our morning message is where much of our literacy instruction happens. As for small groups I will work with whoever is at a centre and target those children's needs within the play. 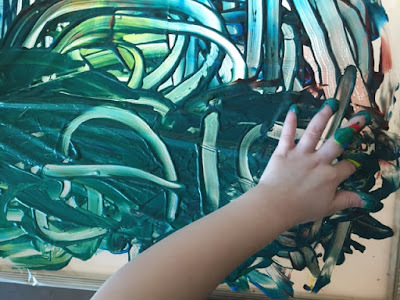 For example if a child could benefit from fine motor work and is at art, I might suggest and then model how to use a tool within his or her play to strengthen this. I also do have small group time here and there when needed (if it's a rainy day and we do not head outside we often will offer small groups while the other children find a quiet activity for the carpet). Sometimes I will pull small groups while my DECE runs a circle or she will during mine. I do not call children out of the play for small groups because it takes me from the play as well and my experience has been children never are interested in being taken from a preferred activity to come and work with me. It's fruitless and they begin to resent me for it. Thank you for sharing your day. I think it would be wonderful for more teachers to share their day because there are so many ways in which the child's day can run. Have you ever asked the children to organize the day or organize the way the room is set up. That could be quite interesting. I was just wondering how you work on your current inquiry project each day. You mentioned that there are a number of activities related to an inquiry. Is there a small core group that works together each day in order to go deeper into a concept. I love you work on puddles. We did something like that a few years ago. We filmed the children jumping into the puddle and then showed it to them in slow motion. This led into a physics exploration on how water moves. Since we are in a school which has a high school, we could visit the grade 10 physics class and learn more about water movement. Anyway, I look forward to hearing more about the amazing work the children and teachers are doing. I am also a graduate from Ontario.